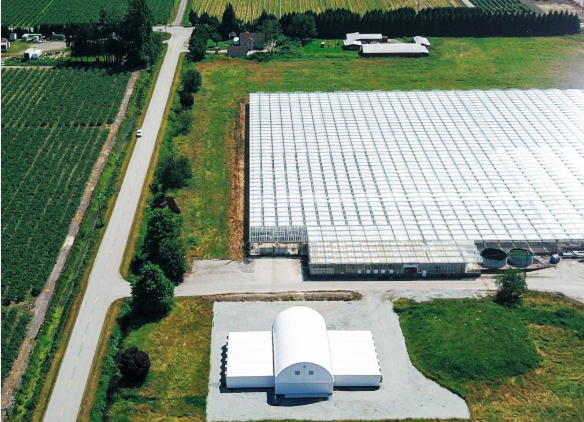 Zenabis' predecessor company was Bevo Agro Inc. (previously TSXV:BVO), an established 53 acre greenhouse plant propagation business with a successful 30+ year operating history. 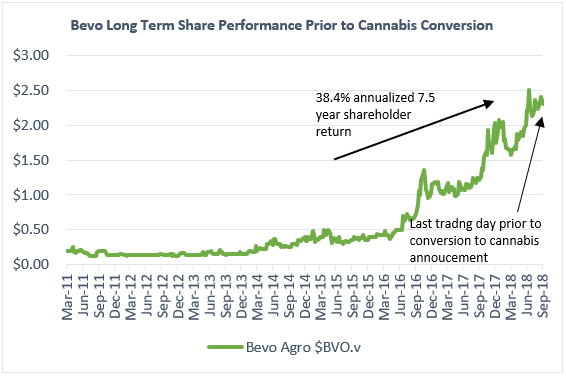 Bevo's history is important and instructive, as it may provide investors with unique insight into the Zenabis' management quality and the probability that it achieves success and leadership in cannabis. Bevo was founded by Jack Benne, and operated by he and son Leo Benne, each lifelong expert Dutch horticulturalists that immigrated to Canada from Holland in 1981. Bevo had a track record of consistent operating results, shareholder value creation and fair corporate governance, which we think provides evidence that Zenabis' management is competent, innovative and trustworthy. This article follows on from our long thesis on Zenabis (link below), which we believe has an intrinsic value of ~$21.00/share. Bevo achieved consistent and growing operating metrics which drove well-above average long-term shareholder returns. 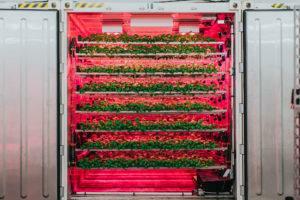 Bevo developed an industry leading vertical farming technology now being commercialized by CubicFarm Systems Inc. ("Cubic"). Cubic was minority owned by Bevo and its interest in Cubic was spun out to Bevo shareholders in January (concurrent with the Zenabis RTO). Cubic recently raised capital at a $100m valuation. Although family controlled, Bevo treated minority shareholders fairly, taking modest salaries, issuing minimal management options, and spinning out its interest in Cubic allowing shareholders to realize value for the asset. provide a background on Cubic and its spin out to Bevo shareholders. Recall: Zenabis, a Canadian licensed producer ("LP") of cannabis, was formed via a Reverse-Take-Over ("RTO") of Bevo in January 2019. Although RTOs have been commonplace in the cannabis industry, this transaction was unique in that it was an RTO of well-established public operating company with valuable production assets and management talent, rather than of an empty shell company. Based in Langley, BC, Bevo is North America’s largest plant propagator. Bevo was founded in 1987 by Jack Benne and son Leo who are lifelong, expert Dutch horticulturalists that immigrated to Canada from Holland in 1981. Bevo grew from 109,000 square feet (2.5 acres) of greenhouses on 26 acres of land in 1987 to 2.3m square feet (53 acres) of greenhouses on 110 acres of land today. It propagates vegetable plants such as tomatoes, peppers, cucumbers, as well as bedding plants, flowers and poinsettias sold to established greenhouse growers, nurseries and retailers throughout North America. Plant propagation is a niche agricultural business supplying greenhouse growers with young, well rooted, healthy and pest free plants grown under stringent, controlled conditions. 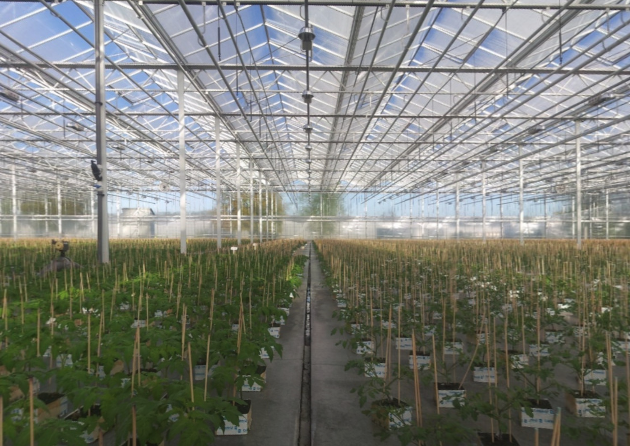 Traditional greenhouse growers purchase propagated plants typically when they are less than one month old, grow the plants to full maturity, and subsequently market/distribute them. The "upstream" business of propagation is an attractive one as it requires specific growing expertise, and benefits from inherent economies of scale and barriers to entry that limit competition. a) growing expertise: plants in the seedling/germination stage require additional care and observation and careful protection against potential contaminants. b) economies of scale: as young plants take up less space than mature plants, centralizing seedling production in one location creates space, equipment and expertise efficiencies. c) barriers to entry: due to their fragility, young, propagated plants cannot be shipped long-distances, therefore insulating an incumbent producer from competition from other regions. Harnessing these factors, Bevo generated consistent operating results over time as it supported and grew in lock-step with the BC and Alberta greenhouse industry, which itself grew from a combined ~450 acres in 1986 to 1,600 acres in 2016 (Statistics Canada data). 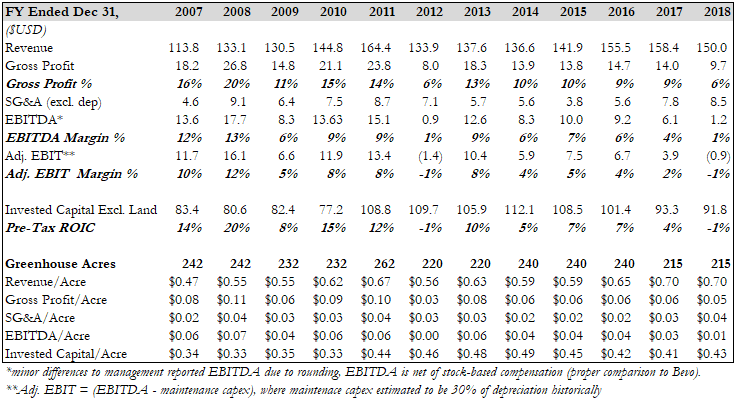 The above chart illustrates the stability of revenue growth over time, with the exception of 2007 to 2010 during the great recession, a period of stagnation in the greenhouse industry likely due to capital constraints at the time. However, during that difficult economic period, the company remained EBIT profitable. 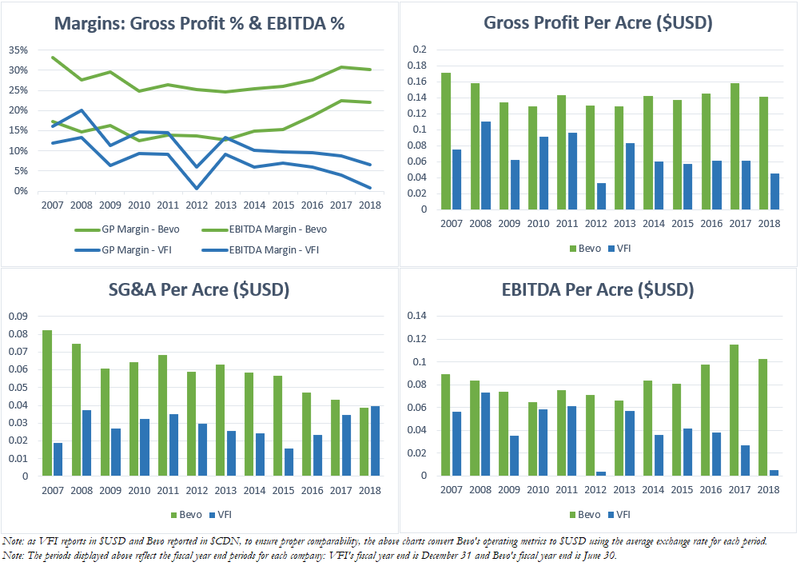 Despite exogenous factors impacting the company during the great recession, revenue and EBITDA grew over its history, while operating metrics like gross profit margin and SG&A per acre were consistent and stable. We think Bevo's ability to grow while sustaining healthy operating metrics over the long-run (and especially a decreasing SG&A per acre) is a testament to the operating capabilities of its management. 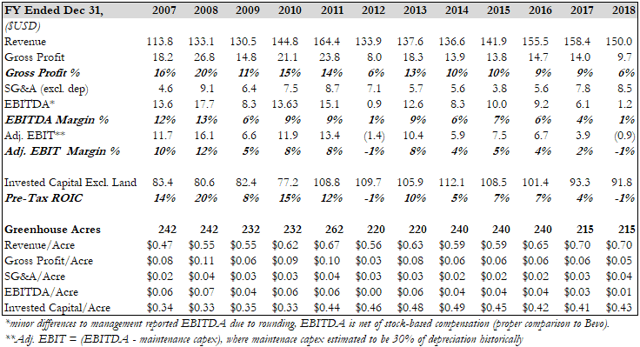 Lastly, these operational achievements drove attractive long-term shareholder returns. The following chart is a long-term share price history for Bevo, from March 2011 (beginning of period for which share price data was readily available) to October 4th, 2018, the last trading day prior to its announcement to conversion to cannabis. Its ~7.5 year total shareholder return was an impressive 38.4% per annum. While we acknowledge that cannabis is much different from the plants grown at the Bevo facility in the past, the operational consistency and excellence achieved prior by Leo Benne (now Zenabis' Chief Growing Officer) and his team at Bevo give us confidence that Zenabis can be successful in cannabis production as well. Although VFI's financial performance was solid in the early years shown above, its performance for the most recent past has stagnated, and is characterized by generally inconsistent revenue growth and margins. These charts indicate that Bevo compares favorably to VFI's on some key metrics like gross profit margins, EBITDA margins, and per acre profitability/efficiency. 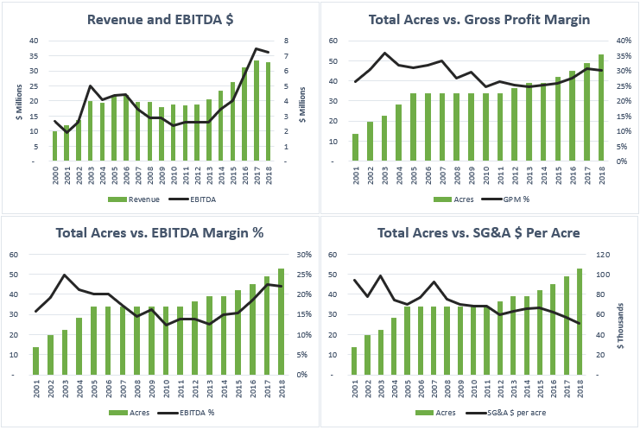 Additionally, as Bevo grew its acreage over time, it was able to consistently reduce its overhead (SG&A) per acre. 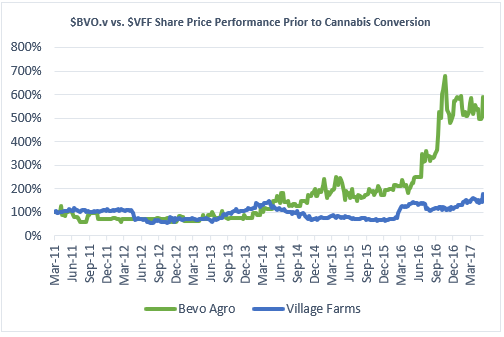 Lastly, the following chart compares percentage share price returns for Bevo and VFI from March 2011 (starting point at which data was readily available) to June 4th, 2017, the last day of trading prior to VFI's announcement of conversion to cannabis (i.e. last directly comparable period of trading history). For the 6.2 year period above, Bevo's share price outperformed VFI's by a reasonable margin, with the companies achieving annualized shareholder returns for the period of ~33.2% and ~9.9%, respectively. While we acknowledge that upstream propagation (Bevo) and downstream produce growing (VFI) are different businesses with different economic drivers, we think cannabis investors may find these comparisons instructive. Spin-out of CubicFarm Systems Corp.
We think Cubic's development and commercialization is an excellent example of Bevo and the Benne family’s ability to innovate in agriculture. As well, the spin out of Cubic is an example of Bevo's past willingness to unlock shareholder value in a fair way, and the spin out has so far proven to be a material windfall for prior Bevo shareholders. Concurrent with the RTO, Bevo spun out to existing shareholders its ~41% interest Cubic (Cubic is currently private but it is anticipated that Cubic will be listed for trading on the TSX Venture Exchange in Q2 of 2019). As a private company, Cubic recently raised $10m of capital at a $100m valuation, which values the prior Bevo interest in Cubic at ~$25m, a windfall for prior Bevo shareholders. Cubic recently provided its shareholders with an operational update that indicates the company is making significant progress deploying its systems globally. Pictured above: A 12-machine CubicFarm located at Bevo's Pitt Meadows, BC, facility (company website). A key aspect of the investment thesis for Cubic is that it appears to be one of the best business models in the indoor vertical farming industry; the level of automation inside its growing machines significantly reduces the required land footprint and capital and labour costs relative to the more common warehouse "rack-and-stack" model of is competitors. Curious readers are encouraged to view the above content for Cubic, and the websites of its three main competitors, Plenty, AeroFarms and Bowery Farming, and draw their own conclusions as to the potential of each business model relative to Cubic's. We think the historical achievements and success at Bevo are instructive and should give Zenabis investors some confidence that its management is competent, innovative and trustworthy. And lastly, we are hopeful that the Bevo management and the original founders of Zenabis will work together to create a world-class cannabis company with proud employees respected by consumers and shareholders alike. Disclosure: I am/we are long zbisf / TSXV:ZENA. Additional disclosure: THE ANALYSES AND CONCLUSIONS DEVELOPED BY THE AUTHOR CONTAINED IN THIS PRESENTATION ARE BASED ON PUBLICLY AVAILABLE INFORMATION. THE VIEWS AND CONCLUSIONS IN THIS REPORT ARE THOSE AND ONLY THOSE OF THE AUTHOR. THE WORDS ‘US’, ‘OUR’ OR ‘WE’ REFERS SIMPLY TO THE AUTHOR. THIS PRESENTATION AND THE INFORMATION CONTAINED HEREIN IS NOT A RECOMMENDATION OR SOLICITATION TO BUY OR SELL ANY SECURITIES. THE AUTHOR DISCLAIMS LIABILITY ON ACCOUNT OF ANY PARTY’S RELIANCE ON THE INFORMATION CONTAINED HEREIN OR WITH RESPECT TO ANY PURCHASE OR SALE OF SECURITIES.